What a wonderful place is Spa-Francorchamps. The circuit exudes atmosphere and history, the memories of brilliant races and wonderful moments piling in upon us as we view the swooping curves, the steep gradients amongst the forested hills of the Ardennes. I cannot see the Eau Rouge corner without instantly recalling the sight of Andrea de Cesaris at the very limit of adhesion, powering through the dip and up the hill in the gorgeous Alfa Romeo 183T, leading the race (and the field for dead) and apparently unbeatable. That was one of the most unlikely scenarios ever seen in F1, de Cesaris and the Alfa both being regarded as quick but hopelessly unpredictable and fragile. On that day, however, Andrea was magnificent, especially through Eau Rouge, never putting a foot wrong although on the razor edge of disaster; it was one of those great injustices of life that the Alfa should have remained true to its reputation, the engine going bang just as we began to think it possible that de Cesaris might win this one. How fitting then that this great circuit should provide us with another example of the impossible happening before our eyes. 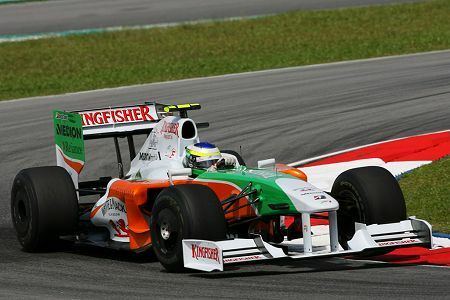 Another Italian, Giancarlo Fisichella, has astounded us all by putting his Force India into pole position. We knew the car had been getting better all season and this weekend it has been right up there at the sharp end in practice, but who would have guessed that old Fizzy would have the beating of the entire field? If Brawn's early season success was a fairy tale, this was the stuff of sheer fantasy. I am a sucker for the underdog and I smiled as the great ones failed to get near Fisichella's time. Alianora, long a supporter of the team in its various disguises, must have raised her household's metaphorical roof when it became clear that her hopes had been answered at last. Regardless of fuel loads, this was an achievement to be treasured in memory. The Toyotas, too, came good on this high speed track, and Jarno Trulli reminded us of his qualifying reputation by grabbing second fastest. Indeed, it was veterans' day out, Nick Heidfeld too showing his younger team mate the way as he put the BMW into third spot. If the three were to finish in that order, it would be the oldest podium F1 has seen in many a year. We wait to see how much influence light fuel loads had on this most unlikely of grids but, for a moment, there is no harm in savoring a season that can produce as many upsets as has 2009. Let those who complained of the predictability of Button's wins in the first few races remember that nothing is guaranteed in F1. Jenson himself found it impossible to get the best from the BGP 001 and languishes down in 14th spot. How the mighty are fallen. He was not the only one, however, names such as Hamilton and Alonso being amongst those who failed to progress beyond Q2. The blame fell on sector 2, all of the top three cars being quick through its twists whereas the McLarens, Ferraris, Renaults and Red Bulls lost great chunks of time in that part of the circuit. It now looks as though Barrichello is Button's greatest threat for the championship, the Brazilian's fourth spot promising a good points haul. And the Red Bull challenge fades as Vettel and Webber could manage no better than eighth and ninth on the grid. Spa may be only one race but Monza looms in the future and form there is likely to be similar. I'm happy for the top three but can't help but wonder about fuel loads, light weight being the order for high speed cornering. I feel there are far too many variables at play in present F1, leaving far too many openings for yellow flags, safety cars and the like to influence the outcome of races. Let's hope for these top three to finish where they qualified! Hmm, well Toyota could also need a win, so I will go for Trulli, but I think Kimi also will be on the podium. He is always strong here. Clive, You can then have Nick at 4th place. My mind is with the conspiracy theory here. Why? Because you can have an upgraded Force India with a stunning pole here. Or maybe, a revitalised BMW making you happy with quickNick as the fastest in the camp. Or a furious Trulli showing those nippos what a brilliant old serious racer can do when his seat is under threat. But to have the three at the same time.... man, that is a bit too much to be true. After all, children don't come from Paris. F1 doesn't really exist. It used to. I know because I saw it quite a few times here, in Canada. It is a local gambling scam and/or T-shirt pedaller who's been tossed out of the USA. I'm pretty sure it's run from the abandoned Marks & Spencers that's been boarded up for so long. The only other possibility is that it is a virtual serial run by Scalextric. Nick: Well, the fuel weights are out now (see F1 Fanatic's excellent calculation of first stint laps) and prove that Fizzy set the pole lap on a very light tank, just as we suspected. Both Trulli and Heidfeld are set to go a few more laps before stopping, so Giancarlo will have to build a big early lead if he is to remain in contention for the win. Even so, it would be great to see Force India score points at last. Barrichello, Kubica and Glock are very light too and dependent on good starts and luck with traffic therefore. Raikkonen has a similar fuel load to Heidfeld and Trulli and could be in contention for the podium if he can pass a few cars at the start. Yesterday I had a funny feeling that Kimi was the one to bet on for this race - we shall see. The Red Bull boys and Rosberg went for long first stints, obviously convinced that they had no serious chance of pole and the Q1 and Q2 qualifiers are all heavy as usual (with Nakajima heaviest, naturally). Hezla: Trulli had his chance to win in Bahrain - this time it should go to Nick! God I love Spa ! Never fails to dish up a corker, and this year it didn't even have to wait for the race to start ! Just a thought, if Rubens had made the top three, we would have had the three oldest drivers on the grid at the front of the pack. Has that ever happened before? Peril: Almost certainly during the fifties, when most of the drivers were much older than they are now. Fangio is a given, of course. I'm not a great one for statistics, however, so I can't give you chapter and verse. That was a welcome suprise, watched F1 on iPlayer as I usually do, expecting the usual run of the mill qualifying and probably race tommorrow but I was wrong. So glad that this has happened for Fisi, one of my favourite drivers for years in the paddock and looking at those fuel figures, it's honestly staggering he's out-qualified Barrichello with vertually the same fuel. The old guy's still got it, eh. i have a theory to add here. The common thinking in F1 today seems to be that the younger the driver, the better. But maybe the teams should beging to rethink this? To have drivers with a little more experience may be the way forward. Needless to say, Romain Grosjean could prove me wrong here in the next few races, but i still think it would be good to let the youngsters keep racing in the lower series a few more years. Congratulations Fisicella, you have earned this! site and if true it would place Nick Goodspeeds assessments right on the mark - BINGO spot on. Should this tale come to fruition then F1 is as good as dead. This bombastic accusation puts Alonso yet again into the center of more than just a mere controversy and makes a right joke out of Liar Gate. But it will kill F1 make it as pleasantly straightforward as watching a Don King fight. Thank You Clive for willing Ferrari to victory! FORZA FERRARI and FORZA CLIVE! SPA, What a race - the best race this season so far. Why can't we have 17-20 races like that pr. season. Clive, you predicted right. Kimi won. But there is one thing I am thinking about when you hear Kimi's comments after the race regarding the move on Fisi after the safety car period. "I knew that I had to get past him because we were on the same strategy," he explained. But when you look at the start weights. then you should think that Kimi should pit some laps later than Fisi. Which also F1 Fanatic predicted in his analysis of the start weights. Maybe it is Kimi' Ferrari engine that uses more fuel than Fisi' Mercedes engine and Kimi already knew that. This could really be a problem for Ferrari next year when refuelling is not allowed. Or, welll, I don't know the weight of Kimi and Fisi, only that Kimi should have lost some kilos before this season because of KERS. Maybe he is still heavier than Fisi and all these calculations regarding first pitstop doesn't use the drivers weights. Anyway fuel efficiency will play a bigger role next year. Pootle" I think of you whenever Fisichella does well - there was a time when he was regarded as the bright young hope of F1 and it is good to see that he can still produce the goods when the car is right. You're right, the old guy still has it. Björn: I think we're emerging from a period in which young drivers were favoured by team managers much more than of old. That was caused by the success of drivers like Alonso, Vettel and Hamilton but, of course, not all new drivers are as good as they proved to be. This year is almost the year of the veteran, with the old names lining up to win races and I think teams will go for a mixture of youth and experience in future. It just makes more sense than having two newbies in the cars. Michael: There may be something in the story as the FIA are investigating it. And, if it proves to be true, it could be as big a scandal as the Ferrari documents affair, just as you say. Poor old F1 - will it ever be free of all this nonsense? I am absolutely sure that the Ferrari consumes more fuel than the Mercedes (or indeed any other engine in the field). Despite the Safety Car, the Ferrari drivers only managed to eke out a mean of 2.667 laps more than the F1 Yearbook 2008-2009's data suggested was possible. The Mercedes drivers (or at least the two for which data was collectible) managed a mean of 4.5 laps more than suggested. Considering how few laps the two-stopping drivers were doing before their first stop, that is a big difference. If it weren't for the amount of fuel Giancarlo was able to save in the first stint of the race with his engine and his technique (he managed to go five laps further than predicted, which is even more than the Mercedes mean), he would have had to stop a considerable time before he did and therefore lost the race. The only point I can think of where Force India could have realistically got another lap into the car (and thus won the race) was at the end of qualifying. Remember that nail-biting end to the session? Well, Giancarlo was the last car round to complete the final lap - which wasn't as fast as his previous one. If Force India had seen what was coming and called him in at the last moment, Giancarlo wouldn't have needed to expend a lap of fuel getting back. Alianora, long a supporter of the team in its various disguises, must have raised her household's metaphorical roof when it became clear that her hopes had been answered at last.